There was some mixed emotions about last night's Golden Globe ceremony. At first glance, I was happy with some of the winner's last night. At the same time, I am sad to see Tina Fey and Amy Poehler go as hosts. I think their chemistry for hosting is impeccable, especially when it comes to the Golden Globes. They have running this ceremony down to a tee, and whomever gets to host this ceremony next year has incredibly massive shoes to fill. So it saddens me even further that we barely saw Fey and Poehler onscreen last night. I mean really, it blows my mind. Sure, they had some good "Interview" type material a couple times throughout the show. But overall, throughout the ceremony's four-hour running time, I feel we barely saw them. For the best hosts the ceremony has ever conjured, I felt that was a shame. I understand that the NBC had time restraints but can't the studio plan around that? Do we really need two hours worth of red carpet coverage? Can't that time go toward the ceremony itself? 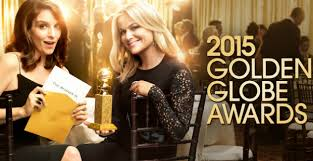 What separates the Golden Globes from say, the Oscars or the Emmy's is that it is a lot less formal, and in doing so, a lot more fun. But I didn't really feel that fun last night, and I always thought that Fey and Poehler embraced that fun as hosts. I wish these nights were less about fashion and more about the ceremony. What I absolutely loved about last night was that "Boyhood" was a big winner. Its pretty rare when a movie that I loved so dearly over last year wins big, and last night, "Boyhood" won best Drama Picture. Also in speaking of "Boyhood," Patricia Arquette pulling a win in Best Supporting Actress in a Motion Picture. I never expected her to win, and I am so glad she did. That was huge for me. I also loved that "The Grand Budapest Hotel" won best Picture-Comedy or Musical. I think that is Wes Anderson's best picture in years, and I love just how much it has been embraced by the general public. I think its been a long-time coming for Michael Keaton to win some kind of award for his work as an actor, and I think his work in "Birdman" represents the best work of his career to date. If Keaton doesn't get the Oscar as well, it will be an extreme disservice to the world of cinema. Just as wrong as when the Oscar didn't go to Mickey Rourke in 2009. This is a once-in-a-lifetime performance for Keaton, and Alejandro Gonzalez Inarritu was lucky enough to catch it on a camera. That's a big deal that I hope Academy voters are seeing. I loved that "Birdman" also got a script nod. I am curious about "Leviathan" winning best Foreign Language film and now I really hope I get a chance to see it before Oscar night. It seems like a cool concept for a movie and I look forward to it. I am also very curious now about "Whiplash," especially after J.K. Simmons winning best Supporting Actor in a Motion Picture last night. It doesn't seem like the typical Simmons fair and that excites me, just another movie I hope to see before Oscar Night. I can saw with sheer honesty that "The LEGO Movie" got robbed in the Animated Feature category. I mean "How To Train Your Dragon 2" was good and all, but not better than "The LEGO Movie." I can also say with confidence that I think Amy Adams is becoming immensely overrated. I mean I haven't seen "Big Eyes" yet. Nor have I seen "Map of the Stars," or "Hundred-Foot Journey" or "Into The Woods." So its pretty clear that the Best Actress in a Comedy or Musical is a category I had very little knowledge of, but seriously Amy Adams? She's just a little too much for me, but hey, perhaps she was the best. We shall see. As far as TV goes, I am happy that "Fargo" was a big winner last night. Even though I personally prefer "True Detective" better, I can say with confidence that "Fargo" was the second best thing on TV last year. I think it deserves all the hype and prestige it is receiving right now, and I hope it can keep up. Kevin Spacey winning for "House of Cards" made me cheer out loud. I haven't seen any of "The Affair" yet, but I am a little intrigued by its big wins last night, as I am with "Transparent." I may just have to get an Amazon Prime account now. The surprise by Prince was nice, but he seemed drunk or stoned or both. Jeremy Renner's "globes" joke to JLo was funny. Tina Fey and Amy Poehler did seem to go all out on their last night of hosting. (AKA that Bill Cosby joke...) I also appreciated the mood of the entire ceremony. I love that these Hollywood people are really embracing their rights as Americans or rights as people living in the free world. There was a powerful attitude to protect those rights last night, and after everything that has happened over the last two or so months, it was quite bracing. It makes what I do with my extra time on this blog much more rewarding, as I feel these artists are trying to deliver their best work each time. I love that the most for sure. And George Clooney? Honestly, what can I say? The guy is a true artist. Good for you George, good for you. So what did you all think of last night's ceremony? Were you happy overall? What was your reaction?